I cannot believe its day 26... I cannot believe that I will actually get this done! I had it on my list that I wanted to complete the full Pearl challenge so the one layout I had left (retroactively) was #2. I completed that today!! Love those BG felties! Have a great Friday and long weekend! I managed to get a few things done today including the Mid Monday Mojo Pearl #8 on my previous post!! I absolutely love that picture and I am happy with the layout! In the mean time, I watched the Tim Holtz video the other day on kraft resist paper and ironically I just bought some new distress stain so I wanted to check it out. I've had this christmas paper for awhile but never used it for the full effect of the distressing. So, I decided to have some fun! I started out with a strip of paper that shows the 'Christmas varnish'. I then covered the entire thing with the picket fence distress stain. The reason for this is that it brings out the colors from the distress ink better than if we applied it directly to the brown kraft paper. Playing around I used the brush to slowly rub my green and red distress ink along the edges and on the paper to get this effect!! Cool, hey?? I now have this saved for a rainy day!!! So cool!! As a side note - here's a storage tip for your distress ink. Use a small strip of your glue tape and put it on the bottom of the distress ink. Take off the sponge for that particular color and store it underneath. Once I finished playing I set out to find some paper to match my pictures I picked out for the mid week mojo.... and realized that if I don't organize my paper soon... I am in TROUBLE. I did successfully organize my stamps the other day... but my paper is still in a mess. I do have it organized by section, brand, holidays... but its definitely hard to find a piece of paper in this mess. You'll also notice that I do not like to close the drawers.... lol. I'd like to organize my cardstock at least over the weekend... Good luck to me! Here's the pics! It's a teeny tiny space jam packed with stuff! I managed to find a photo that would work with the mid week mojo at scrapbooksteals. Here it is! OK on to my next post!! Have a great day! With my list in tow, I grabbed the 'tea time' pictures and found some Fancy Pants paper that matched perfectly... I love these pictures. It just cracks me up and definitely will be some time to look back on later in life. Although, Aunt Darleen went a little crazy that day, it was nice to sit down with the four generations of girls after we left our great grandmother's 100th birthday party... Too bad she wasn't there to join us in five generations. Materials Used: FancyPants Baby Mine, Summer's End and School's Out collections, SU Attic Boutique tags, Webster's pages Silhouettes, Jolee's French boutique buttons, BG alphabet letters, Lilybee letters and SU paper piercing mats, SU crumb cake ink and SU chocolate chip marker. Ohhhh, I had a new to toy to play with and I have to say its a new favorite... I still don't have my new sewing machine out of the box yet so I thought I would try these out. 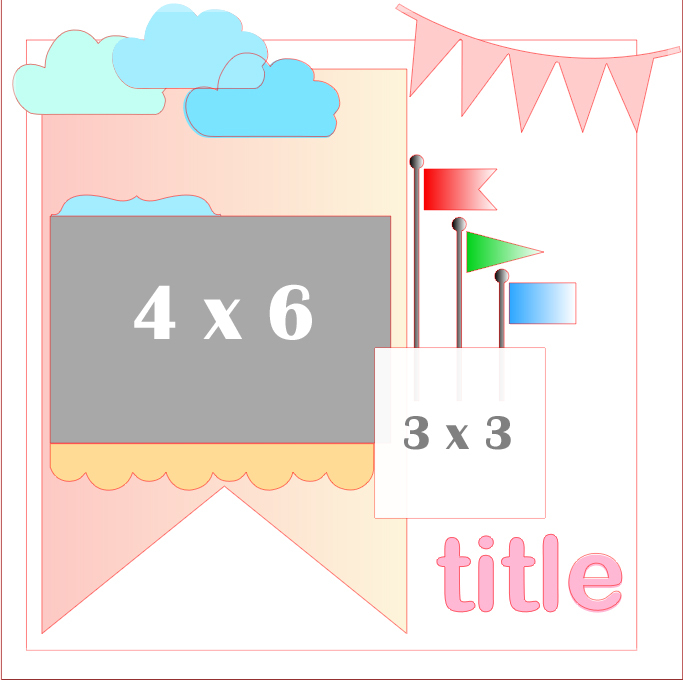 You'll notice the final details of teeny tiny holes going around the border of the layout. It's the new paper piercing packs from Stampin Up. (And yes, I am bias... butttt... I love it!!) To get this look all you have to do is line up the grids, put the paper piercing mat underneath your paper and grab your paper piercer - then... start piercing!! Normally I would say you don't need the extras but I highly recommend you to buy the new paper piercer as it ensures that the depth of each hole is the same, which gives it the similar look. I tried the old one but it was too big. To get a closer look... check it out!! Well, its official - they can't recover anything on the ol' computer. I started this at 11:30pm... TOO LATE. This Mama needs to sleep!! Don't worry, there will be nap time tomorrow... And Jane promised me that she would sleep in super late. I grabbed those chicken photos again because they CRACK ME UP. The story is, I brought home Mary Browns (think KFC) for supper one day. This is not something I do very often because a) I don't like fried chicken very much and b) you can't get a darn thing good for a child to eat there (not that its good for adults). So, Jane had her supper - which was macaroni salad and a skinned chicken breast. It wasn't long before Ryan was gone to work and I was with Miss Energy herself. She booted upstairs to have a dance party in front of the mirror. This is OK because I can get some laundry done while shes doing this. You have to understand that she might only be two but she does carry on a conversation. She told me she was going downstairs to get some water. And I said OK. I let her go downstairs as I thought she'd come back up. Soon, I hear her singing "look at me mommy. I gravy... chicken... dip gravy..." Upon hearing these words, I ran downstairs to find her half way up the table marching. Licking her chicken leg, now covered in gravy, as if it were an ice cream. GROSS. Again, gravy is not something she is every allowed to have except at family functions when I don't have it in me to argue.. (Did I say that out loud?) Now when you see things like this... you should probably grab her off the table and scold her.... but I just died laughing this particular time. I then told her to get off the table, grabbed my camera and off she went upstairs to continue the dance party. And this is where I took the photos to make sure that Ryan believed it... its truly not hard to tell "like father, like daughter". What a time she had with that "gravy on a chicken leg". I am not sure if this layout is done but I lost my creativity and so shes done for today. Enjoy. Point is... you gotta tell the story... that's what it is all about right?? Just a quick post today as Big Brother and Breaking Bad come on tonight!! Yahooo! I've started some of my goals from my post yesterday but nothing off my list. 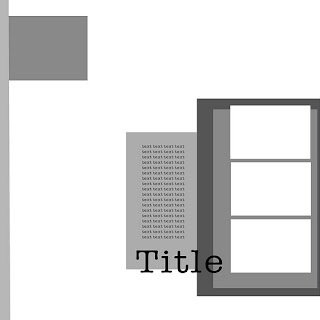 Here's a winter scene layout - no people!! That's a first for me!! This paper is stunning but was designed by The Little Yellow Bicycle with weddings in mind as part of their Swoon collection. I ignored that fact and covered up the 'i do' and 'love'. I couldn't figure out a smart way to cover the 'always' and got over it. You can't tell here but the silver is embossed and shimmers thus making the shimmer in the Bo Bunny frost wrap pop, as well as the thickers. And of course since we are talking about snow and ice, it accents the pictures. There's not a lot of work in this layout but I simply wanted the pictures to shine. I must say I am happy with it. And that means I have one more Christmas layout to go!! Yeahhh! My husband gave a wonderful Christmas card to our daugther this past Christmas and like a lot of things I kept it to scrap. 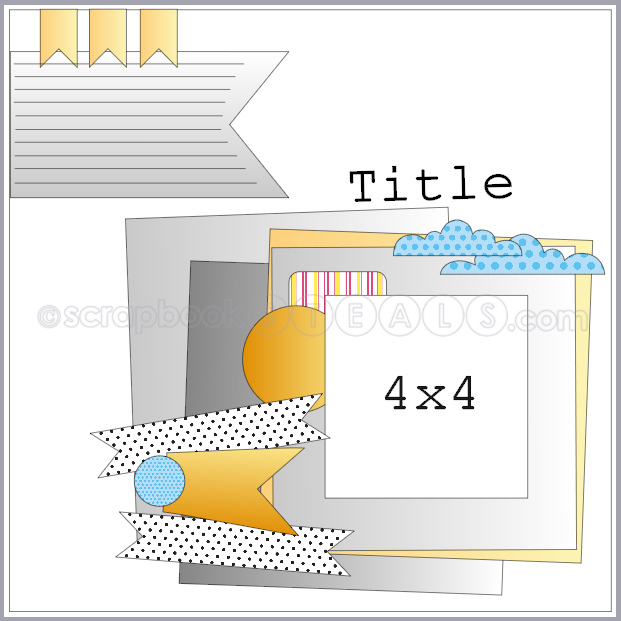 I have so many things like this that I struggle to scrap because I don't know how to incoporate them in my layouts... think valentines, certificates, notes, etc. Anyways, I slowly find ideas and when I saw the layout for the midweek mojo I didn't actually think it would work for me.... While cleaning a small space in my scrap room, I found this card... and it came togther nicely. Here's the sketch!! 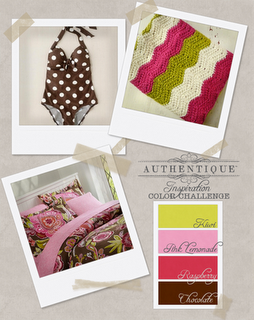 You have until Monday night to complete this challenge so click here to participate! 1. Make a list!! 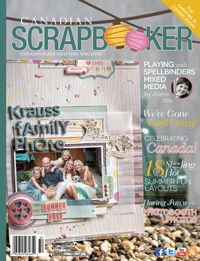 What would I like to scrapbook? Techniques to learn? Things to buy?... I know, I always say I should make a list but I never do. So, this week as I go along I'll be looking at that. 2. 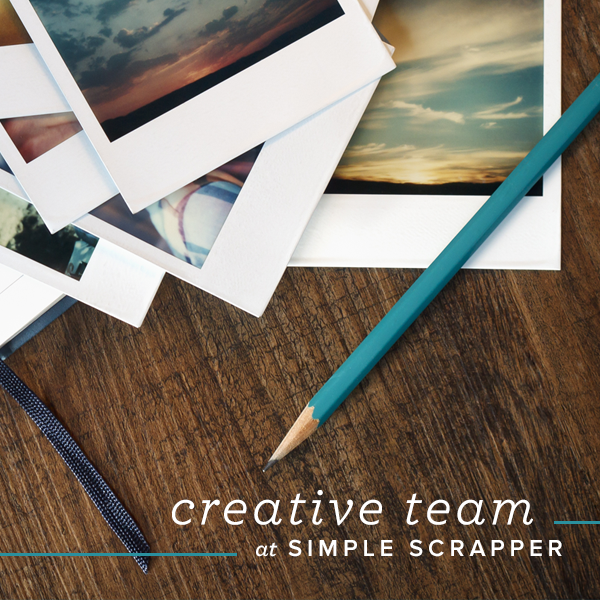 Go through the dreaded box of pictures along with the scrapbooks to see if there are "gaps" that need to be scrapped. I don't scrapbook in order sooooo my books are out of order and certainly have holes. 3. Print the new pictures I want/need. Alright, so my family is attending a birthday party tomorrow for Aunt Courtney AND Uncle Paul. Luckily I have been on the ball and have a card for Uncle Paul that I did for a swap awhile back. But Aunt Courtney.. not so much. I've slowly been going through and cleaning my scrap space and ran across a 'color spritzer'. I have had it for a long time and it hasn't been opened... so guess what? I opened it and read the instrcutions and decided to try it. This is what it looks like. It's as simple as grabbing a marker and slipping it into the slot and screwing it tight. I believe its an SU exclusive producce but I might be wrong in that department. I decided I couldn't stop there and went ahead and made a card with it for Miss Courtney!! It appears to be simple (and it is) but I love it. Sometimes, simple is amazing!! Actually, I love the single stamped white cardstock colored. love, love! 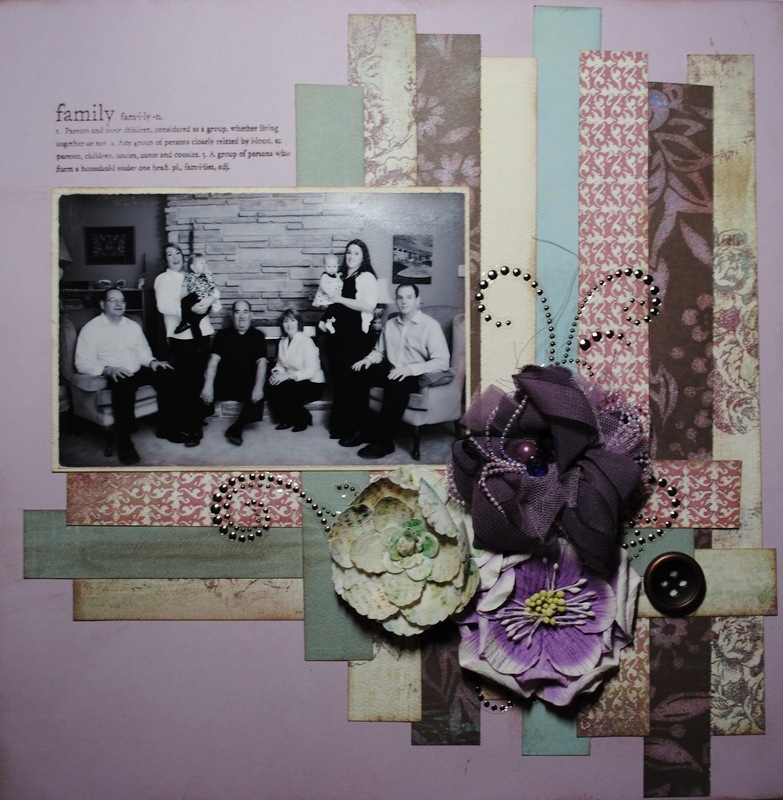 I decided I couldn't stop there and went ahead to finish up my Christmas scrapbooking pages but it fit in with the scrapbooksteals mid week mojo challenge... Check out this separate post!! So, I got a couple more things off my list today!! My friend Kim just a new baby boy yesterday!! Hoorayyyyyyyy. So, of course I had to make a little card for her little boy first... who is nameless at the moment. I cannot wait to meet him but largely I can't wait for my little boy residing in my belly (currently busy cracking my ribs apart) to meet him. They are gonna be besties! :) Here's how it turned out.. its a bit busy but it reminds me of how little boys get so dirty and stinky. Materials used: SU crumb cake card stock, SU bakers twine, Mr Hueys (green and white), SU bitty banners framelits and stamp set, SU brights buttons, Stars brads (retired), SU naturals designer buttons, Stitches buttons (retired), chocolate chip ink, old olive cardstock and vanilla card stock. And with that, I decided I would create the prototype for the wedding programs for Jen. Keep in mind that this is the prototype!! She liked the table numbers and placecards from my previous wedding samples post so I continued with that theme. Since I used retired paper in my samples, I wanted to show the real paper we'll be using - patterned paper from the Twitterpatted collection from Stampin' Up. Here's the sample for you to gage how its coming together. The colors match perfectly, as well as the ribbons. There are doily type patterns on the paper that ties into the table numbers (Click for post). Oh gosh, its beautiful and elegant!! My daughter would say... "Oh. My. Gosh. Sooooo. Cute!!" Here's what I came up with - showing the front and the back with 4 separate flaps of information. Please take note of a couple things though - This white paper is just regular computer paper but we'll be using proper whisper white card stock, which will add to the elegance. Also, you will notice that the stamping isn't crisp on the right and this is because it was the only paper I had in the "basic grey" color and its textured (meaning it has little bumps) - it isn't the best to stamp on. Those two things will change on the real thing. Materials Used (All current Stampin Up product): Everything Elenor Stamp set, Precious butterflies stamp set, Organza Whisper White ribbon, Basic Pearls, Basic Grey textured paper & versamark. The other thing I want to note is that the pearls are likely not necessary but I wanted to show the option. It could also be possible to not use the Mr & Mrs stamp at all. 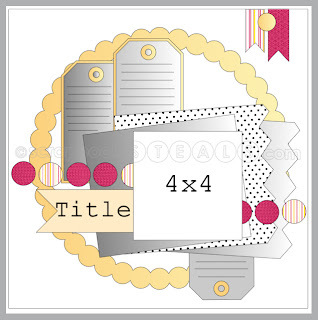 If you really wanted everything to tie in perfectly you cold use the Hello Doily or Delicate Doily stamp set. 1. Grey cover - 8 1/2"x 5 1/2" scored at 1" and 7/8"
2. First layer (date) - 5" x 5"
3. Second layer (Ceremony) - 5" x 5 3/4"
4. Third layer (Wedding Party) - 5" x 6 1/2"
5. Forth layer (Acknowlegdgements) - 5" x 7 1/4"
Have a wonderful weekend!! Cheers! 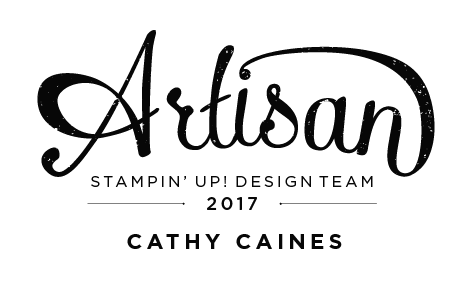 I just got an awesome shipment from Stampin Up and wanted to play!! I know its Christmas but honestly, you can never be too early, right? I love love this stamp set so I thought I would come up with something for it. Then I remembered the ribbon carousel challenge of the week and decided to work with some embossing and "bumpin" it up! Materials Used ( all Stampin Up this time): Cherry Cobbler, vanilla and old olive card stock, Early espresso Core'ordinations paper, Victoria trim, Crumb cake scalloped tulle ribbon, brushed broze buttons, SU hat pins (retires), Winter Memories stamp set, Crumb cake ink, early espresso ink, Lacy Brocade embossing folder, SU pearls, cherry cobbler and original dazzling details, as well as blender pens. 1. Cut half a sheet of cherry cobbler card stock and score it down the middle. Cut a piece of the Core'dinations Early Espresso paper 5 1/4" x 4". 2. 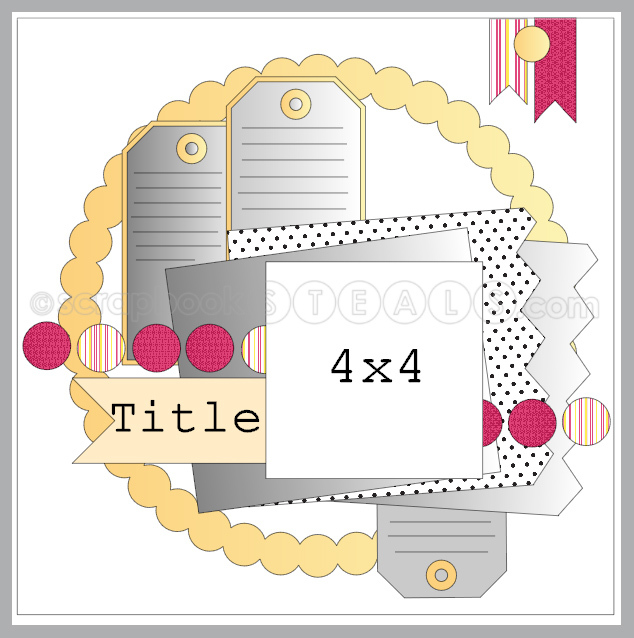 Using the lacy brocade embossing folder, run the core'dinations paper through the big shot. Sand the top of the this using the sander to give it that vintage look. 3. Take the victoria trim ribbon (Cut 10") and tie. I didn't use adhesive yet. Tie around the sanded paper and then adher to the cherry cobbler using sticky strip or tombeau glue. 4. Grab your stamp set and using the early espresso ink, stamp the images on the vanilla carstock (3 1/2" x 2 1/2"). Color using blender pens with crumb cake, basic gray, old olive and cherry cobbler inks. Then take scissors and "scrape" along the edges of this paper. Edging it with crumb cake to give it that distressed look. I also lightly rubbed the crumb cake on the paper to make it look even more vintage. 5. Then you are goign to grab your Adorning accents edgelit and run that through the big shot wtht he old olive paper. Be careful with this - keep it in place with a small glue dot as it tends to move sometimes. Then using the new paper piercing pack, line it up with your edgelit and pierce it along using the guide. I love the way it gives those gorgeous preforations!!! And a final touch is edging it with early espresso. You are then going to adher to the card - again using either sticky strip or glue dots. 6. Grab your vanilla stamped paper and line it up against the old olive. I raised mine above the card to give it more of a unique look and make it stand out! 7. You are now going to grab the new crumb cake scalloped tulle and tuck it under the victoria trim. I cut a 6" piece and then just played with it. I secured it with some glue dots to hold the "folds". 8. Finally, time for your embellishments. Grab the SU new bronzed buttons, pearls and the hat pins (retired) and adher. Don't forget dazzling details on the blade and the berries in the poinsetta. 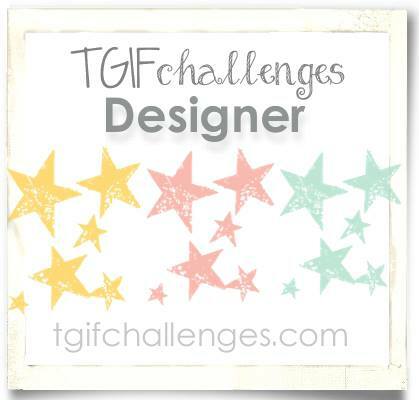 Now, you only have today for this challenge so check it out!! Click the icon below! Have a great day! I won't have another post until much later!! I struggled to get this layout to come together the way I imagined. When I saw the lilybee sketch, of course I wanted to try it out. I then incorporated some of my own elements such as the hand stitched circles!! Although its a Christmas theme layout, the colors don't bring attention to it. 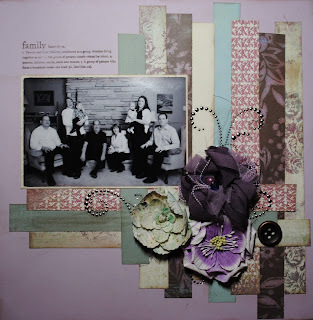 I actually had several embellishments on this layout but ripped them off. Hopefully you can't notice too much. Oops!! I also took advantage of using the merry mini punch pack (trees) from Stampin Up again so that it gave some idea that it was Christmas (besides for the title). Materials Used: Textured white SU background paper, Lilybee Dutch patterned paper throughout, AC thickers and BG alphabet stickers, and We R Memory keepers Sew Easy Fancy Floss, SU Night of Navy marker. And finally I was trying out and playing with my Mr. Hueys today to come up with a card... Ummm... it did not turn out the way I wanted but its something alright. There was supposed to be three colors "mismashed" in order to look like a tie dye t-shirt.Instead the bottom red color over powered the middle calico Mr Huey. Ha. I then contrasted the card with black to make it pop and edged it with 'pool party' ink from Stampin Up. I put some AC buttons on there with SU twine to make those butterflies pop... Butterflies, you ask? Well I used some Maya Road wood veneers as a mask. Love the idea but the tip of the day is to practice your sprays before applying. Bumb dadadadad dooo - here ya go! Well, inspired by Cheryl's comment to give myself more room in my scrap room by putting away my holiday paper... I decided that this week I need to find a way to finish up my 2011 Christmas layouts before the next Christmas season comes upon us. I only have about 3 layouts that I would like to do but I just keep avoiding them because I can't find anything to match them... it just seems like a huge job. Anyways, we'll see if I can achieve that sucker. I'd also like to complete the pagemaps challenge. Anything else is bonus!! Jane, who just turned two is now officially home with me in the day time. We took her out of daycare as I am off on mat/sick leave. My husband, Ryan also works in the evenings and weekends so it was a good time for Ryan to hang out with her and save some money. Lord knows that mat leave is not lucrative! The point is that I won't be able to get my projects done in the days. On another note, our family just laid our grandfather to rest. This has been quite sad but he lived a full life living to be 82. Ironically, on Saturday I was commissioned with the task of putting together the collage that would be at the funeral home. Now this was not a beautiful piece of art but was literally getting as many pictures up on a magnetic board as possible. In the end, all the grandchildren were huddled around boxes of old photos that my grandmother had kept for many years without putting them in albums. The pictures brought back so many great memories and was an amazing thing to do with the family. The experience is something I will appreciate more down the road then at this time because its still a little too close to home that we lost our beloved. The one big question that was often asked was "is that.. Dad...Uncle Wayne? etc". "who is that?" "when was that". So, it brought out the importance of labelling pictures. (in my head I am thinking.. ITS SUCH A BIG JOBBBBBBBB). So, on my next layout relating to a family meal (one of my Christmas promises) I am vowing to write who is sitting at the dinner table. And also vowing to remember to label more often than not. Wow, I meant this to be a quick post. So, anyway, here's my Christmas Eve layout. 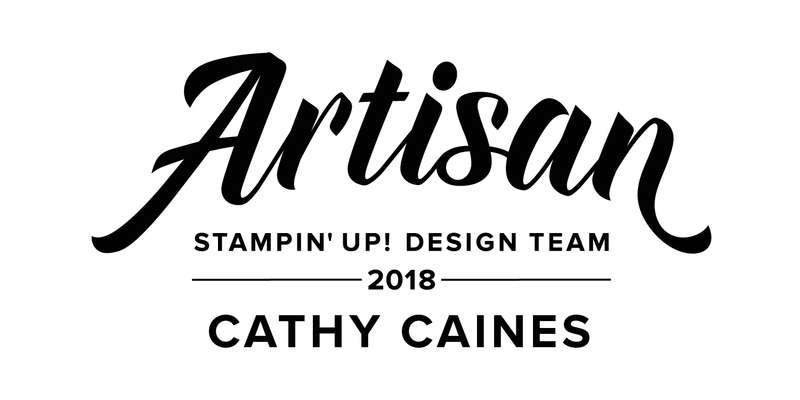 This is not based off a sketch and generally uses the 'Saint Nick' collection from Fancy Pants, which I always love but can never find anything to match! And so, I need to retake this photo in the natural light but you get the point, I would think!! It's a quick one today but I really like the final result! 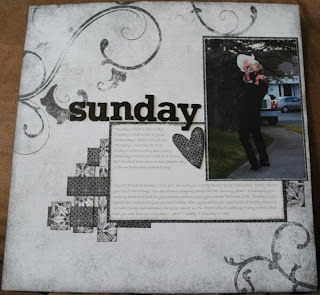 This is purely Stampin Up products because I got a new shipment on Friday and I wanted to play, play, play!! It was mostly holiday catalogue items so Christmas is my theme!! I feel like kraft paper (Crumb Cake for SU folks) is going to be way more in my life soon. LOL. And plain white paper. Its funny how your style changes, hey b'y? 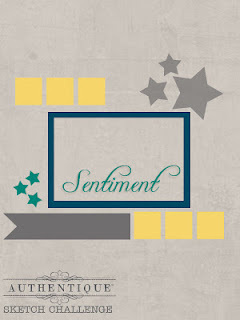 INTRODUCING the Snow Festival collection from Stampin Up. I LOVE LOVE LOVE it. It's a bit different for the SU style so I am a huge fan. This paper pack uses a gumball green color, which is a new In Color in 2012-2013. It really accents the Cherry Cobbler color. The owl paper is just a 5"x1" piece of paper. There is Cherry cobbler card stock underneath which is 5"x1.5". And finally the green gumball patterned start paper is 4"x5". To top it off I added the cherry cobbler baker's twine. There is a new pack of mini punches in town called the Merry Mini Punch Pack in the new holiday catalogue (there is also a super cute stamp set to go with this). I punched a couple ornaments out and added a mini silver brad for a bit of bling. To add my sentiment I first tried to emboss but I did that miserably... I then covered it up with some So Saffron card stock with "Happy Holidays" from the 'Many Merry Messages' stamp set. Note that the crumb cake, so saffron, gumball green and cherry cobbler all match in this paper pack. Anyways, I really like how this came out especially on the Crumb Cake cardstock paper. Never too early to think about Christmas if you ask me... HA! To continue with the Pearl mid week mojo challenge over at scrapbooksteals.com I came up with the following. I actually already had the picture and paper taken out for this on Wednesday but finally put it together today. This truly got me out of my "box" as its not my style to be whimsical in any way. Putting the big Bo Bunny trim on this layout nearly made my heart fall onto the ground but I used my SU sticky tape and got it on there before I changed my mind. 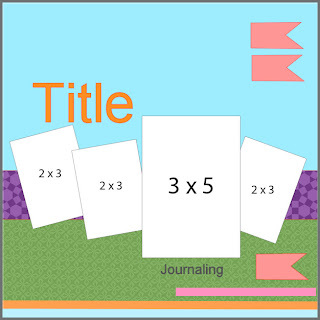 Here's the layout that I followed.. the trick is that I just turned it to work for my picture and journal tag! Materials Used: Fancypants Baby Mine & Winterland collections, Stella Rose journal card, Bo Bunny Trim, SU journal tag, SU Victoria ribbon, BG alpha letters, SU organza ribbon, petaloo flowers, Imaginisce flower, Creative Charms pearls, and Jolee's Boutique French Inspiration embellishments. I amin LOVE LOVE LOVE with this card. I don't know if I have loved a card so much!! This card is going to nobody... shes all MINE. Ha! 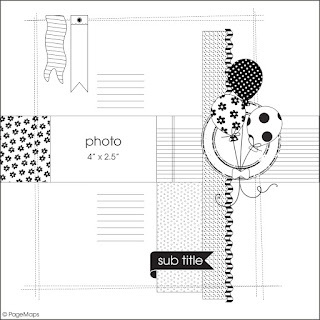 Materials used: Authentique Celebration Collection (Laughter & Rejoice paper) + Lilybee ABC Double Dutch Stickers, SU black cardstock and ink. I cannot wait for the next challenge!! Oh, its been a rough day. Started out with not enough sleep but managed to finish this off to get back to some kind of normalcy! Despite my grandfather's passing, it felt right to make my way through all the pictures. Although this isn't a sketch of him, I am sure he will love it. Here's the sketch - click to get taken to the blog link! Materials Used: Lilybee Buttercup patterned paper, Lilybee Double Dutch paper, MME Genuine stickers, AC thickers, Bo Bunny wraps, Imaginese flower and SU brad. Anyways, I have a plan for tomorrow... Night! Earlier I posted a card using the Gnome Sweet Gnome stamp set for the Ribbon Carousel blog challenge so check it out if you want! This particular project was in the works for a little while. I decided that I wanted to try to make this one exclusive to Stampin Up... which wasn't too hard a choice for me since I don't have any Halloween paper besides SU. However, it turns out this project was really difficult because I didn't have any embellishments related to Halloween. As a result I had to start trying to "make" some and really get those creative juices flowing. Then I grabbed all my chipboard that I had from Stampin Up and found some tags (well, one.. ha!) to use as a grave yard. Then I glued paper on that one, edged it in black again - and finally put some Lilybee R.I.P letters on it. That's all I could think of at that moment so I stepped away. Ummm.... It's a BLACK CRAB. So clearly, that didn't make it to my project... but I do have that on my mind... soooo.. if you need a crab... you know how to make one! Moving on from there I cut up some chipboard frames and cut them into a grave yard. I also created a pumpking using three small ovals and the leaf from the blossom builder punch. Then I found my bat punch and added some cherry dazzling details to make red beety eyeesssszzzzz. And it wouldn't be my project without twine so I wrapped that around there. Ohhhhh and ironically UPS came while I was doing this with my new Stampin Up supplies AND my new sewing machine!! YAHOO. Anyways, I tied the new satin striped basica grey/black to use as a hanger. 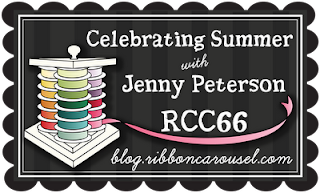 This was a first for me but I do follow the ribbon carousel blog as I can find some different ideas so I encourage you to check it out!! 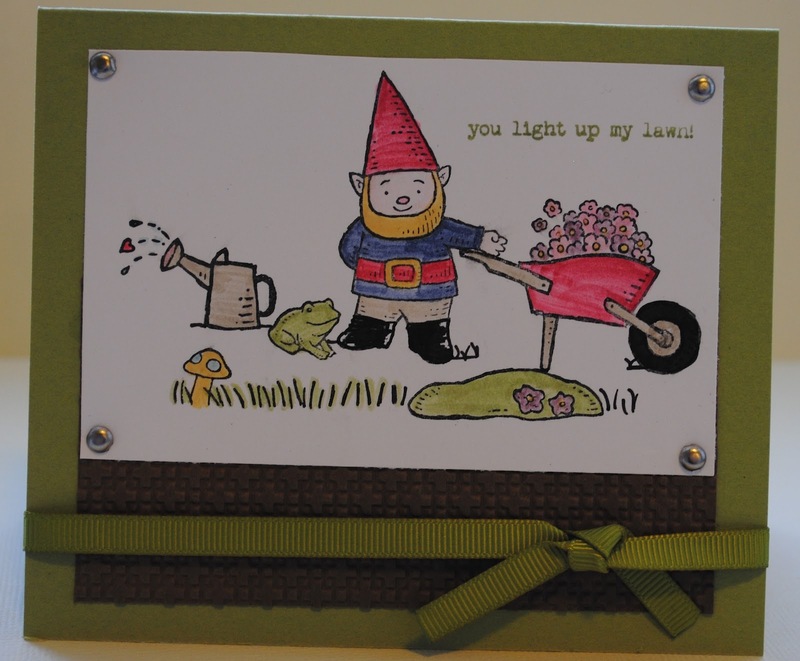 This morning I played with a retired stamp set from Stampin Up called Gnome Sweet Gnome to meet their requirements of a summer theme. You have until August 18th to finish this challenge! Click on the icon below to check it out!